You may have heard of Katrina. Or perhaps her pals Wilma, Charlie, Hugo, Hattie, and Rita. Their ancestors have been around for ages. They all appeared in the fall. They all spun counterclockwise at greater than 74 m.p.h. and wrought havoc in their paths. One of those paths is DeLand, Florida, home to a university. Stetson University takes its name from a hat manufacturer. But every year, it takes more than a wide-brimmed hat to protect residents of the area from the effects of hurricanes. 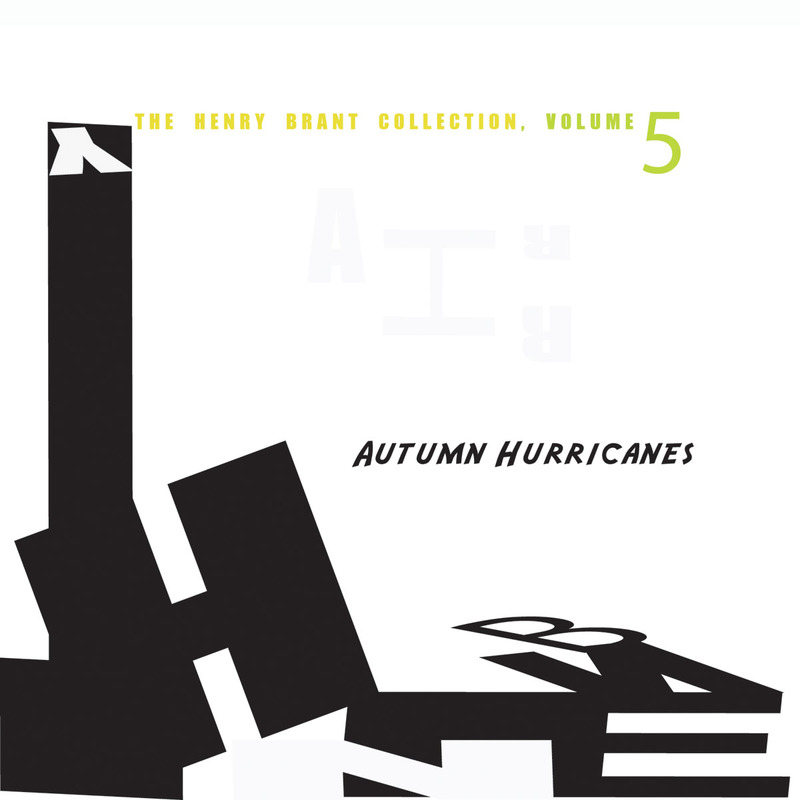 To celebrate the University's first 100 years of existence, Henry Brant wrote a spatial cantata for the assembled musical forces on the subject of Caribbean hurricane history. More than a term paper on regional meteorology or a Weather Channel special, "Autumn Hurricanes" brings to life seven of the most cataclysmic hurricanes to hit the area since 1780. Choirs, soloists, jazz groups, orchestras and brass all contribute to the overwhelming sonic deluge. No injuries were reported at the premiere in 1986. When the University celebrates its bicentennial in a few decades Autumn Hurricanes may need to be updated with some more weather events. In the meantime, if there's one CD you take with you to your storm cellar, it should be this. Wind is whipped here by operatic vocals, gusts of strings, and some nearly cataclysmic deep brass pockets. As a hurricane whips on several fronts, evidently so did this massive ensemble, with five separate conductors taking cues from Brant himself at the calm center. The recording evidently took place appropriately in Florida, albeit out of season in April of 1986. The engineering is fantastic, you feel the pull that unites the disparate fronts. The drums often hit hard and heavy, the snare snap on #5 is like a lightning shot cracking a tall tree. The underlying music often has a big-band near-crime jazz or even sixties sci-fi ponderous vibe. Many were the times I felt I could look out the window and see some gargantuan dinosaur looming on the horizon, even if it were just a mass of dark clouds. The libretto work may be what blows some people away, in both senses of the verb. At times the voices do meld with the force of the music, at other times they feel a bit stagey, more singing in the rain than drowning in the flood plain, even at times they felt a bit comical. The horns and drums alone though deliver a powerful burst of energy repeatedly, and the strings capture the reeling feeling of lost moorings. The idea of being surrounded by this is as impressive as the music itself. The back cover of the CD booklet humorously reproduces a caricature by a Linus Coraggio, depicting the composer at work at his disc - I'm sorry: desk - on a sheet of music paper, with the caption "Elderly composer". There is nothing elderly in Henry Brant's mind. His glee at raising a racket is the mark of an ever young spirit. Not music for those for whom the alpha and omega of contemporary music is the neo-Romantic, tonal, easy-listening stuff apparently fashionable nowadays, but if you like the music written in the 60s and 70s by the European avant-garde - or simply the music of Varèse, you are likely to enjoy this, hopefully as much as I do. Texts provided, good general essay on Brant, very terse notes on the piece itself - but it is self-explanatory, really. Now, beware : this music is LOUD, even deafening at some points (and I personnaly love a good din). Exercise caution when setting the volume.